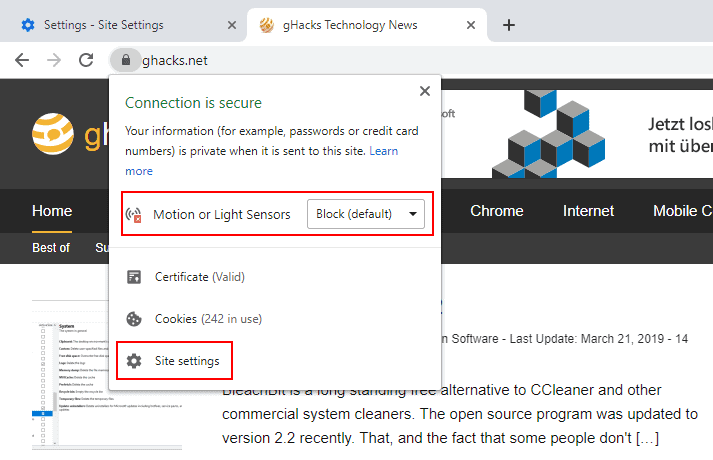 Google added "Motion and light sensors" permission controls to Chrome Canary recently so that users of the web browser may control the functionality. Browser makers like Mozilla or Google add new functionality to their browsers regularly. New APIs, the Sensor API is just one example, add new functionality that sites and applications may make use of. APIs may expose data to sites and services, and may even give sites control over functionality. Web browsers like Firefox or Chrome support permissions that give users control over these features. Sensor permissions are available in Chrome Canary only right now; the Android version and the desktop version supports the option. Canary is a development version of Google Chrome; it takes months usually before features land in stable versions of the Chrome browser. Google added global and per-site Sensor access controls to the Chrome web browser which users of the web browser may use to control access to the Sensor API in the browser. Load chrome://settings/content/sensors in the Chrome address bar. Doing so opens the Sensor permissions in the browser. Toggle "Allow sites to use motion and light sensors" to enable or disable Sensors globally. Sites that you added to the allow or block list are displayed there as well. Tip: You can manage permissions for other APIs and features by loading chrome://settings/content/. Most, e.g Microphone or Camera are set to "ask" which means that Chrome displays a prompt whenever it detects attempts to access these APIs. The option is also available for individual sites. Just activate the icon that Chrome places in front of the web address to get started. 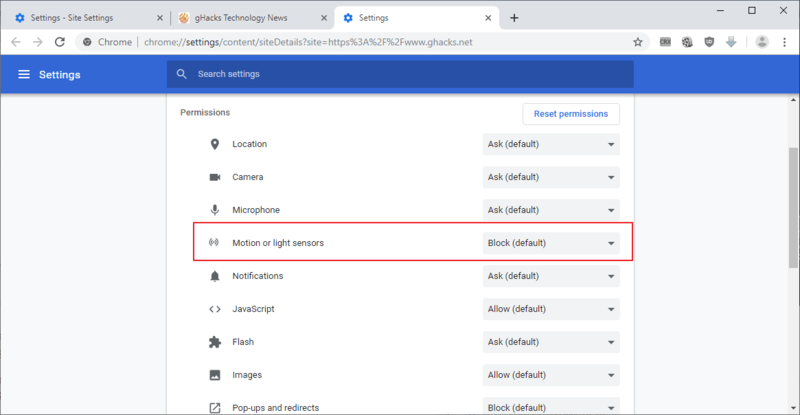 Chrome may display a direct option to allow or block motion or light sensors on a specific site. You may also access the Site settings by activating that link. These display all permissions that Chrome supports. Changes that you may to the site permissions are valid only for the selected site. You may use the options to override global permissions, e.g. to allow a feature on a site or to block it. The option to block Sensor API access landed in Chrome Canary 75 and Google has not yet revealed when the feature will land in the stable version. Chrome 75 Stable could be that target, a release that is about 2-3 months away. What kind of website would even require access to such sensors? I think this sort of thing is aimed less at traditional websites and more at being able to use the browser as if it were an operating system to allow web-based pseudoapplications like PWAs, etc.